Prime Case Funding (PCF) ranked highest in our review of lawsuit funding services for their strong history, fast turnaround, transparency, and commitment to the customer. If you're currently involved in a legal situation awaiting settlement, but need the cash now, PCF is a company worth considering. Oasis Financial simplifies the lawsuit funding process. In the business of lawsuit loans for over 12 years, this company is among the best. Customers will like the responsive customer service team and strong BBB rating. Law Capital provides lawsuit funding loans between $500 to $1 million and specializes in personal injury, workers compensation and wrongful death cases. Law Capital may not be as expeditious as some of the other companies but has a strong history and excellent BBB rating. Lawsuit Cash has an excellent BBB rating and handles only personal injury loans. This company is a branch of First American Finance, a well known finance company. 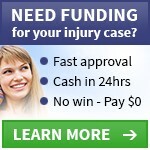 If reputation is imperative and you have a personal injury case, Lawsuit Cash might be a great option. Litigation Capital Investors provides loans between $2,000 and $20,000 for those with pending personal injury cases, and their BBB rating is a stellar A+. While their website is a bit outdated, their rates are among the lowest we've found and they offer a Best Deal Guarantee. Lots of talk and not a lot of consistent promises at the Cash 4 Cases website was a huge turn off. Conflicting language dropped the company towards them bottom of our list despite a strong BBB rating.